We love our new shed. It was delivered on time and looks great. We purchased 2 sheds from Waterloo. The first shed caught on fire when the electrical wire came down and set the shed and my yard on fire. We did not hesitate to call Waterloo back to make us a new shed. Great company, the workmanship is excellent. I would highly recommend and have recommended to friends and family the fine company Waterloo Structures is. (2) 10' by 20' duplex horse stall sheds bought in 2009. In use continuously and in great shape still. (1) 10' by 20' duplex horse stall shed bought in 2015. In use continuously and great shape still except a not so big tree limb fell and put a hole through the roof which surprised the life out of me. (2) 10' by 20' duplex horse stall sheds bought in 2009. In use continuously and in great shape still. (1) 10' by 20' duplex horse stall shed bought in 2015. In use continuously and great shape still except a not so big tree limb fell and put a hole through the roof which surprised the life out of me. Good buy. These guys built me an awesome playhouse/shed. It's really a shed, but I added a porch, loft, and swirly slide. So it's fun for the kids in the summer and functional for me in the winter! I love it and highly recommend them. If facebook let's me post pics I will! 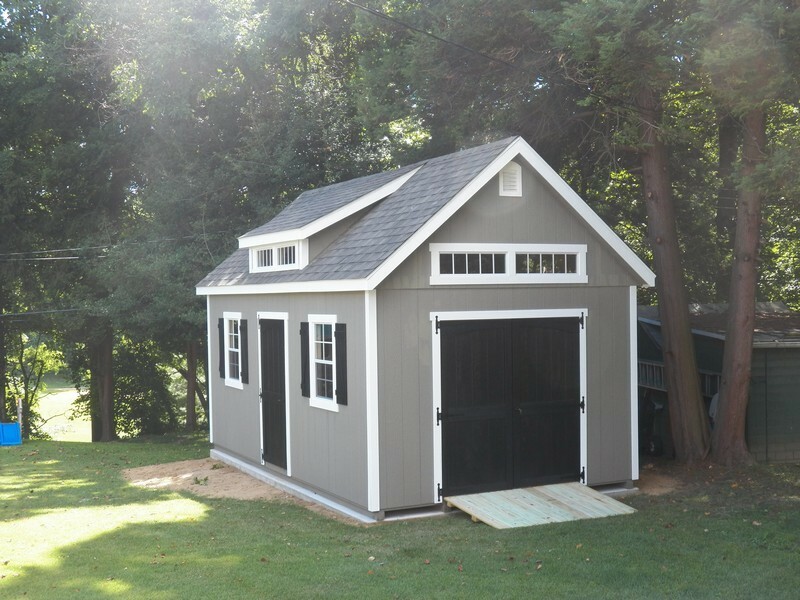 I purchased a 10' x 20' shed to match my existing garage. Waterloo Structures matched it perfectly with a few pictures I sent them. Very pleased with the quality of construction, pricing is very good and sales staff is very knowledgeable making sure the shed you want is the shed delivered. Installation is nothing short of amazing. Perfectly placed. You must follow the preparation guidelines on their website. I purchased a 10' x 20' shed to match my existing garage. Waterloo Structures matched it perfectly with a few pictures I sent them. Very pleased with the quality of construction, pricing is very good and sales staff is very knowledgeable making sure the shed you want is the shed delivered. Installation is nothing short of amazing. Perfectly placed. You must follow the preparation guidelines on their website. Thank you. We continue to be thrilled with our Waterloo Shed. After 2 years, it still looks just as good as the day it was delivered. Great shed, great price, and great people to deal with. I did the entire transaction online.......totally easy.....no issues. The guys who constructed my shed on site where friendly and polite and left my property perfectly clean. The shed looks great and now after almost two years, looks as good as the day it was installed. A GREAT company to deal with!!!! !